KawaiiPunk - Kawaii Mascot Blog: Small Potatoes. Culinary Cuteness! This readers is the fantastically cute Small Potatoes shop. Yes, you did read that correctly! 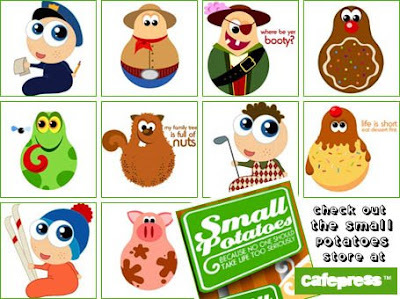 A shop that has taken the humble spud as a starting point and transformed it into a cavalcade of cute characters. It’s got skiers, golfers, policemen, chefs, astronauts, it’s even got a biker potato! It’s a veritable kawaii-tastic snack-fest! Why not head on over and feast on some tasty tattie t-shirts for yourself! Go on, you know you want to!